Polish superman Mariusz Pudzianowski is a bodybuilder, powerlifter, strongman, rugby player and MMA fighter. That's half the departments on my website! He could have a gallery in any section so I decided to put him in "Strength." Oh did I mention he has a masters degree and can sing? This 6'1" (1.85m) muscle mountain is on the short side which is why you see the warning at right. But he is one of the heaviest guys on my site with his weight swinging between 250 lbs. (115 kg) and 340 lbs. (152 kg). During his career as a strongman, Pudzianowski won five World's Strongest Man titles—more than any other athlete—as well as two runner-up titles (including his most recent performance in the 32nd edition). 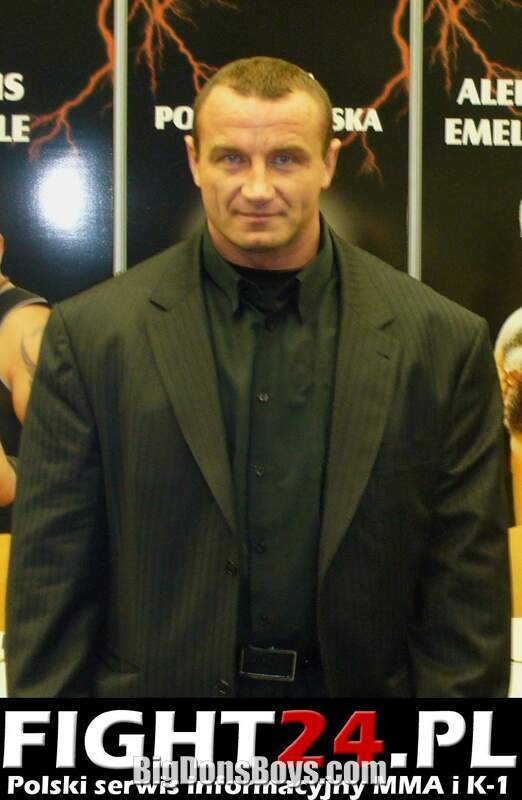 In 2009, Pudzianowski debuted as a mixed martial artist. 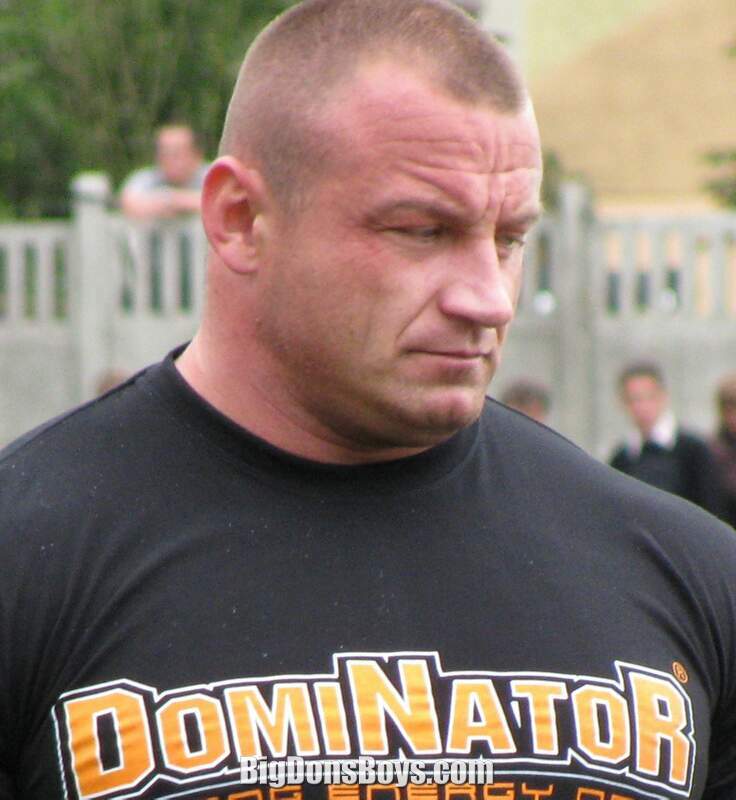 Mariusz Pudzianowski was born in Biała Rawska, Poland. His father, Wojciech, was a weightlifter. Pudzianowski quickly became interested in sports. Since the age of , he has been training the Kyokushin style of karate.His current grade is 4th kyu green belt. He began strength training at the age of thirteen. 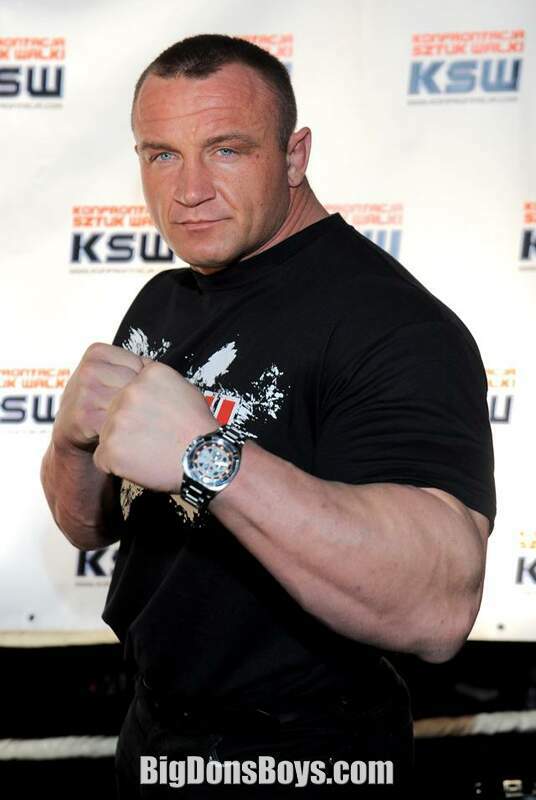 When he was fifteen, Pudzianowski also started training boxing, quitting after seven years. Pudzianowski debuted in professional sports at the age of sixteen, taking part in Polish Weightlifting Championship, in the bench press event. 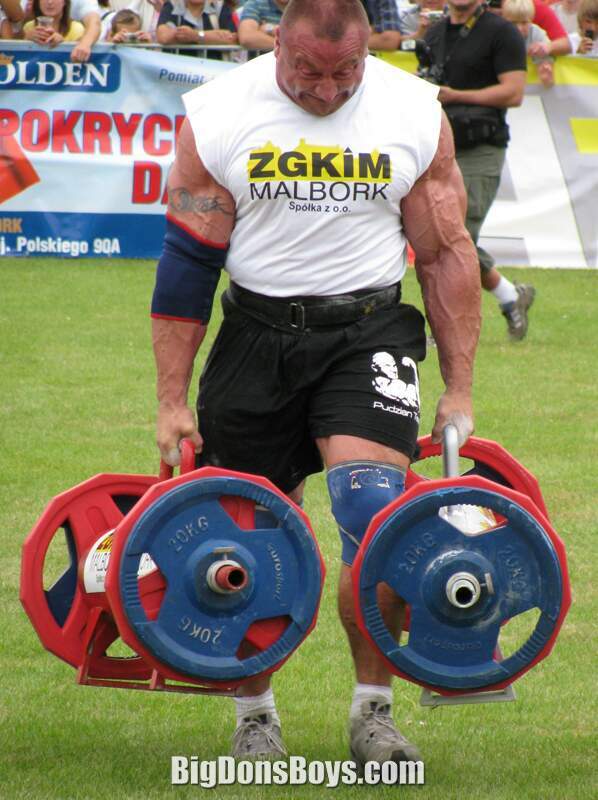 In May 1999 Pudzianowski entered his first Strongman competition, held in Płock, Poland. He achieved his first major success at the international level at the 2000 World's Strongest Man contest where he finished fourth in his first WSM competition. Pudzianowski returned at the 2002 World's Strongest Man winning his first title, he retained his title at the 2003 World's Strongest Man by the largest margin ever achieved in the competition. 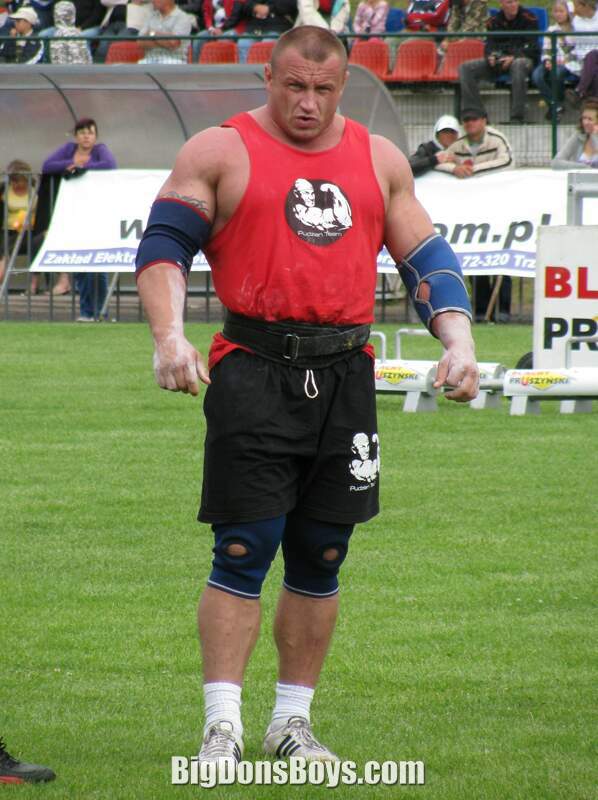 In March 2004, he also became the Strongman Super Series World Champion. He initially finished third in the 2004 World's Strongest Man but was later disqualified for breaching the governing body's Strongman Health Policy. Health policy? They make men carry refrigerators yet they have a health policy? He was forced to return his prize money, stripped of the International Federation of Strength Athletes points from the event, and received a one-year ban from competition. Pudzianowski did not dispute his banned substance violation and waived his right to have his stool sample verified. He then returned to win the title for a third time in 2005. In the 2006 World's Strongest Man contest, he came second to Phil Pfister. Pudzianowski regained his title in 2007, winning with one event to spare (which he had also done in 2003 and 2005). At that time he was one of the three four-time winners (the other two being Jón Páll Sigmarsson and Magnús Ver Magnússon). In the WSM 2007 competition, Pudzianowski said that his target was to become the only person to win the event five times, which he did by winning the 2008 World's Strongest Man in the very last event, ahead of Derek Poundstone. 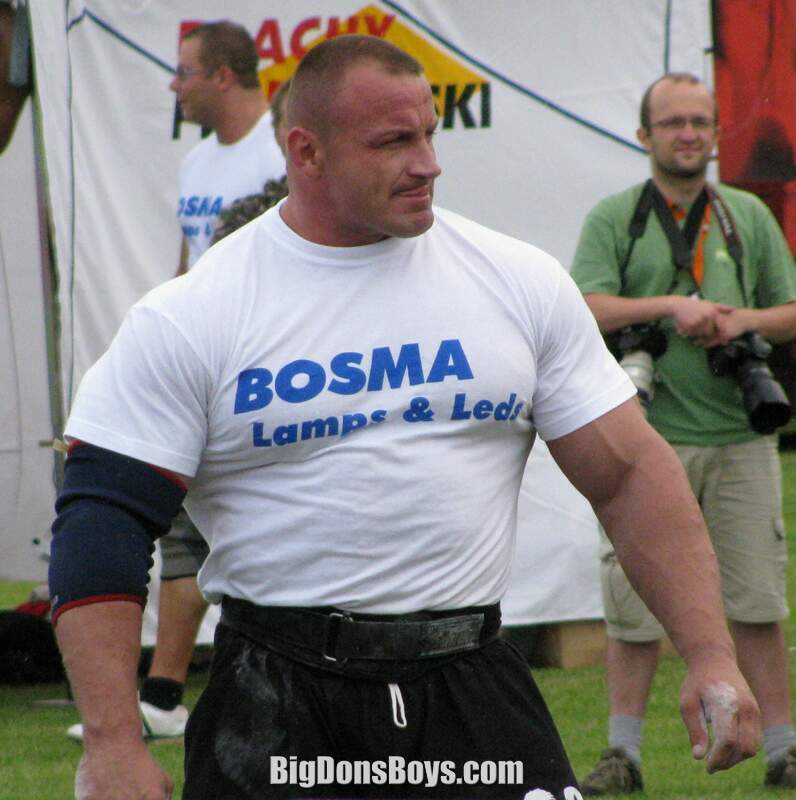 He succeeded despite a serious calf injury, which he suffered in the Polish Strongman Championship Cup of 2008 and further exacerbated during the WSM qualifying rounds, seriously threatening his chance of even reaching the final. 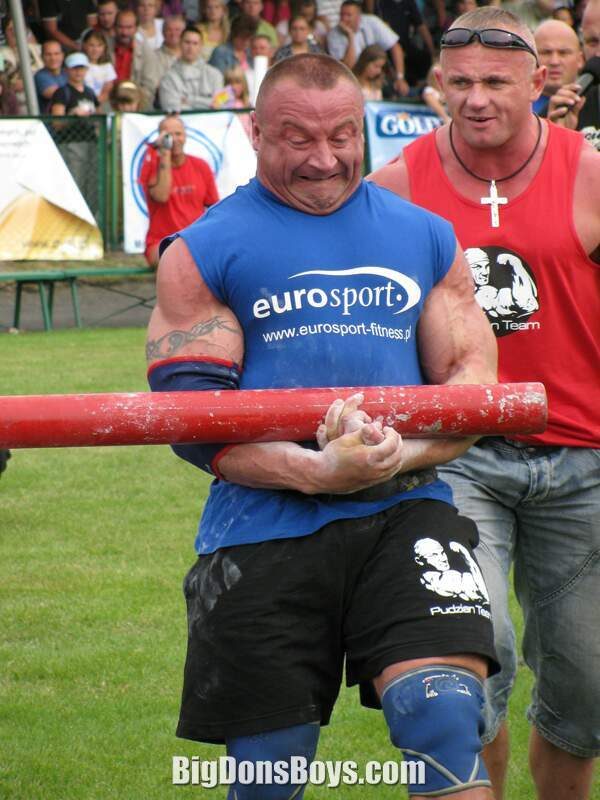 He competed in the 2009 World's Strongest Man competition, which took place in Malta, placing second after Žydrūnas Savickas. In an interview, Pudzianowski said he will not continue participating in strongman events, because of his career in Mixed Martial Arts, which requires a totally different training to strongman. Pudzianowski is liberal with his diet and is often seen tucking into chocolate, ice cream or burgers. On one of the World Strongman events shown on TV, as well as in an interview for MTV, Mariusz when asked about diet said: "I eat everything. I do not follow any particular diet. I eat anything I want, anytime I want". My energy comes from my diet. Breakfast is 10 eggs and two to three pounds of bacon. Between meals, I eat lots of candy. In the morning, it will be several 3 Musketeers and/or Snickers bars; I need them for energy. Lunch, at or 2 PM, is a double meal of a Polish pork chop, sauerkraut and potatoes. An hour later, I work out, then take lots of supplements: magnesium, creatine, amino acids, all that stuff, and more chocolate. Dinner is whatever meat I can grab—steaks, pork chops, bacon—plus more sauerkraut and potatoes. At 9 or 0 PM, I work out again. Afterward, I have a protein shake and more chocolate. At 3 or 4 AM, I wake up and have more chocolate, then go back to sleep until morning." On May 27, 2008 Pudzianowski graduated with a master's degree in international relations. His thesis was: "Organizational culture in sports marketing in the world". Pudzianowski often appears as a guest singer in the musical group Pudzian Band, formed by his brother Krystian. Their first single "Zdobyć świat", was released in 2006. In 2009, the group released an album, Dawaj na ring (Go, hit the ring). In 2008, Pudzianowski took part in the 7th season of Dancing with the Stars in his native Poland. He advanced to the final episode, but ultimately finished second, losing to actress Magdalena Walach. Pudzianowski is currently a contestant in the st season of the singing reality show Just the Two of Us in Poland. He is coupled with former Ich Troje singer Anna Wiśniewska. Bodybuilder, strongman and fighter 6'1" Mariusz Pudzianowski trains in the gym and takes supplements in this brief video.